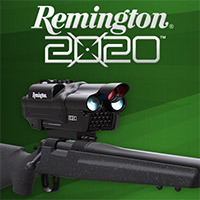 One of the most exciting things we got to see at range day was a pair of siblings from the smart optics family: the Tracking Point Xact system and its little brother, the new Remington 2020 system. Despite getting behind the Tracking Point for some simulation last year, this was my first time sending live rounds downrange with it. Way downrange. We punished the nearly 1000 yard target with the .300 Win Mag version and, since misery loves company, we put a hurting on the 350+ yard target with the .30-06 Remington 700 with the 2020 on top. Another year’s SHOT Show range day at nearby Boulder City is in the can and it was as exciting as ever. We got to see, handle and shoot a number of great new weapons. The exhibitors had plenty to tell us, the range was well kept and, thanks to the RSOs (and everyone’s cooperation), safe. As an added bonus, it wasn’t freezing cold and windy this year. Winning! Are “Smart Optics” Catching On?